But after getting to reading about the country’s national hero, architect Miko Liwanag said that he became “unbelievably impressed” with Dr. Jose Rizal. This was just one of the few stories told in Fort Santiago yesterday during the launch of the My Rizal 150 website. Adarna Food and Culture, which catered the event, served guests with a sumptuous nineteenth-century “privilege class” merienda including empanada de kaliskis from Malolos, Bulacan,pancit 1930, hot chocolate, bite-sized pandesal, and kesong puti. The program included a Rizal mini-quiz, where hosts asked event attendees trivia questions about the national hero. Afterwards there was a tour by Escuela Taller Intramuros director Mico Manalo of the Almacenes Reales (royal bodega), a seventeenth-century structure currently undergoing reconstruction. The project was initiated by a group of family and friends of the Rizal clan, in partnership with various private organizations, agencies, and academic institutions. 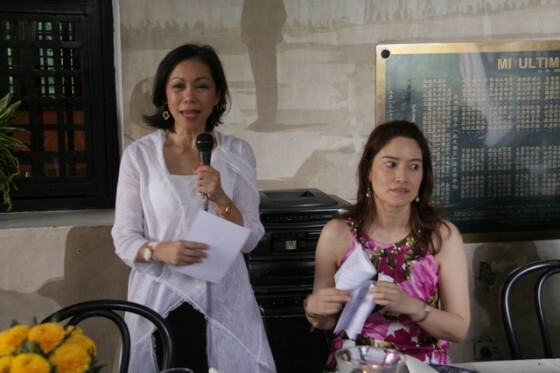 It was spearheaded by Lisa Bayot, the great-granddaughter of Rizal’s eldest sister Saturnina. Others in the founding group are the Binhi English Literacy Foundation, Inc. including Maite Gallego and Binhi members Lois Ilustre, Miles Po, Rosalyn Consing, and Peachy Avancena. Also included are Ria Limjap, Yodel Pe, Tess Salientes Bloom, Gerard Salonga, Liwanag, and Trixie Herbosa Grau (descendant of Rizal’s sister Lucia). My Rizal 150 was also made possible with the support of the Department of Education, Cultural Center of the Philippines, University of the Philippines (UP) College of Arts and Letters, UP College of Science, Ateneo de Manila University, University of Santo Tomas, Ayala Museum, Yuchengco Museum, Lopez Museum, Vibal Foundation, Goethe Institute, and Intramuros Administration. Vibal Foundation is in charge of web maintenance and content, with the website containing various information on Rizal: his works, related articles, and a calendar of activities for his 150th anniversary. The section on Rizal’s Life and Works features his works, reviews of his works, biography, and analyses of his life and impact on the Philippines. Aimed at showcasing the hero’s humanity “with all his defects and greatness,” the Complete Jose Rizal (also featured in this section) was made possible through the cooperation of the National Historical Commission and Filipiniana.net. It is a separate website which aims to publish all known cultural output of Rizal including his letters, essays, novels, poems, and sketches. Also featured in the website is the Encyclopedia Rizaliana of Wikipilipinas, giving tribute to the national hero with its articles on life and times of Rizal. 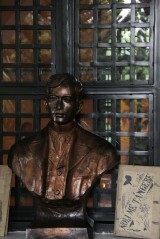 Rizal in the Modern Day is the section is where one can discover Rizal as a national hero, religious figure, and more. For those interested in participating in any of the year-long Rizal sesquicentennial festivities, one can visit The 150th Celebration section. Users can also peruse the Rizaliana Media section, which includes articles, books, photos, and videos relevant to Rizal. Maite Gallego—a relative of Rizal’s contemporaries Maximo Viola and Felix Resurreccion Hidalgo—said My Rizal 150 is also meant to be a central platform to inform as many people as possible about the year-long Rizal-themed activities. “More than a group of people, My Rizal is actually a movement, an invitation, and a challenge for all of us to rediscover Rizal in ourselves and have a deeper understanding of Rizal, his ideals, his heroisms, and to celebrate the Rizal in each of us,” Gallego said. Bayot said that the website targets the youth. Given that Rizal accomplished so much when he was in his teens and twenties, she said that the the youth may be able to relate to him. When asked what set My Rizal 150 apart from other websites featuring Rizal, the two said that it is more youth-oriented, as well as being a purely private initiative, with content put together mostly by volunteers. They added that My Rizal 150 will remain online long after the sesquicentennial year and that more Rizal-related activities will be encouraged after this year as people become more aware. “We’re looking for a year of celebration in education, culture, and arts, and we hope even beyond that,” Gallego said. The two are looking forward to having more content in the website, including more interesting articles about Rizal. According to Bayot, they will be highlighting ongoing events especially in Germany, the country where Rizal became a member of the Anthropological Society and the Geographic Society of Berlin, and where he worked on the novel Noli Me Tangere. The two stated that they want people to keep coming back to the website. “Somebody we spoke with said that you peel one layer after another and there’s always more and more to discover, and that’s what we want the public to realize,” said Gallego. “I guarantee you, the more you learn about him, the more you will want to know more about him,” said Liwanag during the website launch yesterday, remembering how he was “forced” to read about Rizal and research on his architecture in Dapitan. “If we pattern our approach to everything, he is somebody who is an excellent role model,” he said. Rizal Shrine Fort Santiago curator II Zarah Escueta commended the Rizal family’s participation in the commemoration and celebration of the national hero. Escueta also suggested that the My Rizal 150 website add a section about Rizal Shrine in Fort Santiago. “So mapo-promote natin much more although sometimes we do not need any promotions for Rizal or anything about Jose Rizal kasi talagang dinadayo, pero syempre kailangan pa rin nating i-promote ito,” she said. Escueta says that it is her personal advocacy to promote Rizal through social networking sites, as the administration has no funds provided for this.